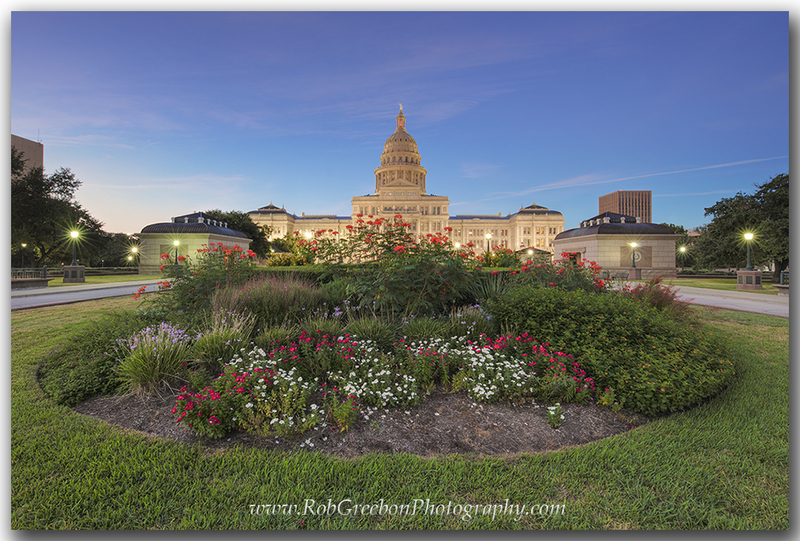 The State Capitol in downtown Austin, Texas, is a photographer’s dream. The building itself covers 2.5 acres of land and is surrounded by 22 acres of lush, well-manicured trees, gardens, and shrubs. Along with the greenery, over 20 monuments and statues fill the grounds, each commemorating an important figure or event in Texas History. And here is a bit of trivia… did you know the same man who designed the Texas State Capitol (Elijah Myers) also designed the Michigan and Colorado Capitols? In return for his services to Texas, he was granted 3,000,000 acres in the panhandle! The Capitol opened in 1888. Over the years, this landmark has undergone several renovations. In 1990, an underground Capitol Extension was built on the north side of the building, creating a few unique opportunities for photography including a ground-level glass atrium that can be used as a foreground, a 65-foot deep open-air rotunda, and several flower gardens. On a mild September morning, the historic Texas State Capitol glows in the pre-dawn hours in downtown Austin. In the foreground rests one of the many gardens on the 22 acre complex. The Capitol building itself takes up 2.5 acres, and on the surrounding land are trees, grass, rose gardens, and over 20 monuments commemorating important times and figures in Texas History. I enjoy shooting the historic architecture in the early morning or late evening. In the half-light of morning, the red-granite building seems to glow in the warm sunlight. Even before that, you can enjoy a nice deep blue (known as the blue-hour) to accentuate the sky above the capitol. When doing this, I often bracket my images (taking 3-5 images of the same composition with different exposures). The Capitol is lit by bright floodlights at night, so these different exposures can be used to soften the harsh or overexposed light or even blended together in HDR fashion. Monuments around the Capitol can be used as foreground elements or even for close up telephoto or macro images. Another of my favorite locations is the Great Walk – the sidewalk leading from Congress Avenue to the front steps of the Building. The checkerboard path makes for great contrast, especially when converting an image into black and white. Play with the level of your tripod for different views of the sidewalk. As noted in the previous paragraph, I mentioned a tripod. I always shoot with a tripod because my exposures area usually several seconds long during the hours I’m there. I always shoot as ISO 100 and most often use a wide-angle lens set at f/11-f/18, depending on the proximity of my foreground objects. I have two galleries dedicated to the Lone Star Government Seat – one linked above and on Texas State Capitol Gallery here. The latter is a newer website featuring only Texas images and usually has more current photography and prints available. Feel free to visit either site, and don’t hesitate to contact me should you have any questions!